All of a sudden, a voice from the sky says, “Less than a minute,” to an anxious crowd. “And…they are off!” and the voice seemingly releases eight thoroughbreds thundering down the track, sending electricity throughout Louisiana Downs. The voice behind these announcement is Travis Stone, 29, of Schroon Lake, N.Y., current public address announcer of Louisiana Downs. Stone has held a fascination in horse racing since he was a child, which was influenced by his father and previous generations. In Saratoga Springs, N.Y., lies a track famous for horse racing. Stone refers to this as the best horse track in the country. From seeing races there as a kid, his inspiration continued to grow. At only 18 years old, Stone took part in his first meet at Suffolk Downs in Boston. Stone graduated from University of New York at Oneonta in 2005 with a degree in Mass Communications. He also engaged in the opportunity to attend the Missouri Auction School. Stone has called races all over the United States in places such as Miami, San Francisco, Louisville, Houston, Dallas and other locations. Several months after graduating, he was contacted about a new position at Louisiana Downs. After one flight to Bossier City to see the track, Stone realized that this was his new home. Stone has now been with Louisiana Downs for seven years now and enjoys every minute of the experience. He is part of a small team of core employees who organize the races for thousands to see. Although Stone is isolated in the sky box from the roaring crowd, racing horses and the overall thrill of the moment, he said he has the best seat in the house. 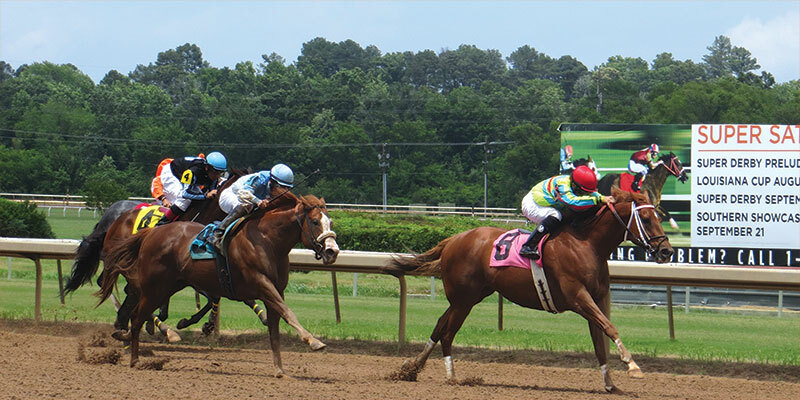 When Stone is not announcing, he steps outside of the box to work closely with the general operations department and marketing and is over the mutuals team at Louisiana Downs. Travis points out that announcing is not as easy as it looks — the bigger the race, the more preparation is required. The Super Derby is the annual race Louisiana Downs arranges every September. In order to be prepared for the race, Stone admits that the secret is to watch replays of the horses and to plot different scenarios that could happen so that whenever it occurs he knows exactly what terms or phrases to use.